Imagine opening up a new hotel and having moisture problems throughout the building. The owner of a 4-story, 96-room hotel contacted us about a significant water intrusion problem across the building’s exterior, reportedly present since the day the hotel opened three years earlier. Terracon was asked to determine and recommend the appropriate repairs needed to make the building’s exterior generally water-tight and eliminate the interior moisture problems. The project became increasingly complicated as further issues with the building were discovered during our investigation and testing. Other building consultants had been retained to solve the moisture intrusion problems at the hotel, but while limited suggestions and possible solutions had been opined, nothing definitive was determined. The owner was frustrated by the lack of progress and wanted the problem solved as soon as possible. Based on the information we received up to that point it was believed the exterior insulating finish system (EIFS) installed across much of the building’s exterior was poorly installed thereby causing the moisture problems. We didn’t realize at the time that the EIFS was only part of a larger problem. Our original investigation consisted of first performing an infrared thermographic (IR) survey of the building exterior in its entirety, as well as at several interior areas by Terracon’s Certified Thermographer to identify anomalies and potential areas of moisture within the walls. We then selected several locations where the EIFS could be removed for closer evaluation. This limited removal and assessment occurred soon after the IR survey. 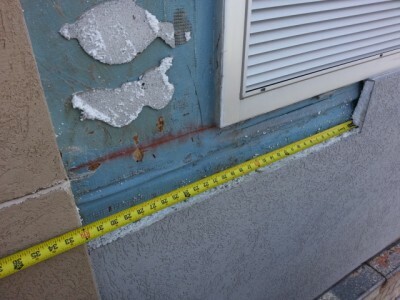 In general, the EIFS was found to be thinly applied, but otherwise appeared to be in serviceable condition. During this initial phase, we also observed the general conditions of the other installed exterior systems. We realized the building was likely experiencing moisture intrusion problems that extended well beyond the EIFS installation. While EIFS was typically installed on the building’s upper floor levels, brick veneer was present across much of the first floor level. Within the brick veneer, numerous cracks, separations, and displaced bricks were observed. The mortar joints appeared to be poorly tooled at many locations. The caulking applied around the windows was inconsistent and missing at some locations. All of these conditions can allow the passage of moisture into the building. At one location in the brick, an electrical junction box was uncovered and connected to an open conduit. No wiring was present, but the box provided an unimpeded avenue for water to enter the building. Inside the building, significant amounts of air infiltrating some guest rooms around individual through-wall mechanical units were readily detected while little to no air infiltration was detected around the units in other rooms. Several windows were reported to leak. These issues suggested problems with the underlying flashing were present. At the conclusion of the IR survey and the subsequent EIFS investigation, we had more questions than answers regarding the performance of the building envelope. We were unable to provide solutions regarding the repairs that were necessary to prevent moisture intrusion without a more invasive and destructive investigation. In addition to informing the owner of our findings, we recommended a series of tests be performed with ASTM standards employed where applicable. The owner agreed with our approach and authorized the additional testing and investigation. During the course of destructive testing, we also discovered multiple hidden construction deficiencies, such as no headers installed over several windows and steel angle brick lintels that were unbolted to the framing underneath or attached with drywall screws. We also observed other issues such as a “mushroom” growing between a window frame and adjacent wall and moisture dampening/staining a ceiling during a spring storm. Rainwater penetration through the wall assembly, including but not limited to: control joints, brick veneer cracks, EIFS cracking, and thin EIFS application. Trapped moisture in the wall from pre-existing and current roof and/or thru wall flashing deficiencies. Water vapor from the exterior and interior condensing inside the walls. Combinations of the above sources. Due to the amount and significance of the problems it was determined that the as-built wall assemblies did not conform to industry standards for a building of this type. The problems were so widespread that it seemed unlikely repairing or replacing specific areas would remediate and eliminate the issues. Ultimately, we recommended that complete replacement of the systems would be the most effective method to remediate the widespread issues. As a result of our findings, the owner opted to demolish and replace the building exterior components commencing in early 2015. Terracon is now providing consultation and observations throughout the re-construction process.